It all started on the 12 of May 1998, when Freddy and Jake were sitting in a car on their way to Motala to watch the Gamma Ray/ Iron Saviour gig that was going to take place later on that evening. From the carstereo you could hear classics such as old Helloween, Maiden, Priest and many others. The guys both thought that it was a bad thing that there were so few bands theese days playing this kind of melodic speed/heavy metal from the 80´s so they started to talk about forming a band just like this. At this time it just stayed by thoughts and talk but later that year, after having visit the WOA, the guys became more concrete with the ideas. At this time, Jake were playing with a death-metal band called "Vapid" who had an incredibly talented drummer called Gustav. Since Jake and Freddy already knew him, and also knew that he would do a great job behind the drums, Gustav was asked to be the drummer of the band. Even though it wasn´t really his bag, he accepted since he thought it would be a fun thing to do.It was also necessary with one more guitarist so another friend called Erik,(also a member of "Vapid" ) was asked to be a part of the band. He also accepted.The guys were also searching for a basist but they couldn´t find any so the only solution was for Freddy to take the bass as well. He had never played this instrument before, only the guitar, but after a few rehersals, this turned out quite well anyway. 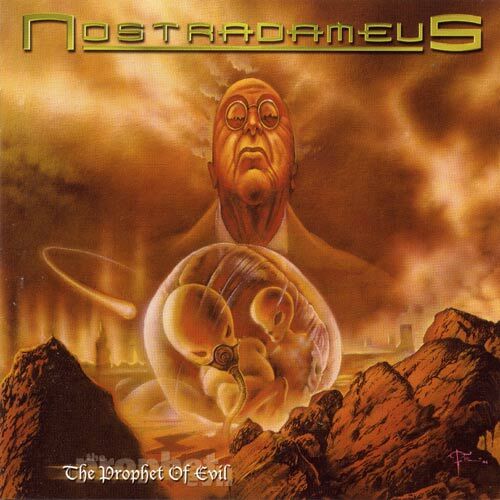 From the beginning, the meaning was that Nostradameus was only going to participate in two rock-competitions in their home town, just as a fun thing. But on one of theese competitions, there was a man in the jury called Magnus Lundbäck, who immediately fell in love with the music of Nostradameus. He also was the chief of a label called Gain productions, and when the gig was over, he asked the very surprised guys if they had a demo. Since they hadn´t, he offered them to use his studio to record one, and after a few weeks of songwriting and other preparations ( Nostradameus only had one own song at this time ), they entered the studio on the 5-6 of December -98. The result was a real killer and the guys were really satisfied with it so on the 7:th, the demo was sent away, but only to five labels, all german. 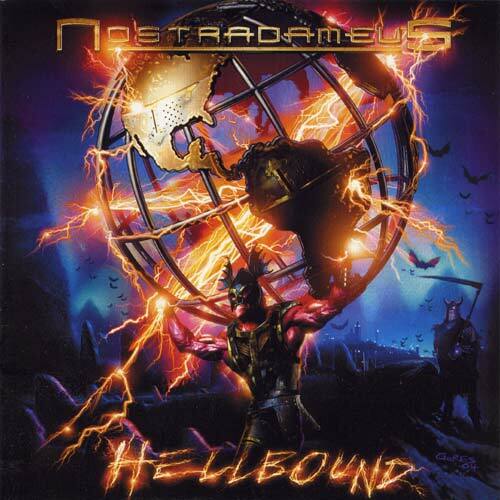 The answer came two weeks later, from AFM-records who offered a contract at once and after some times of discussions, Nostradameus decided to sign with the label and did so in April -99. 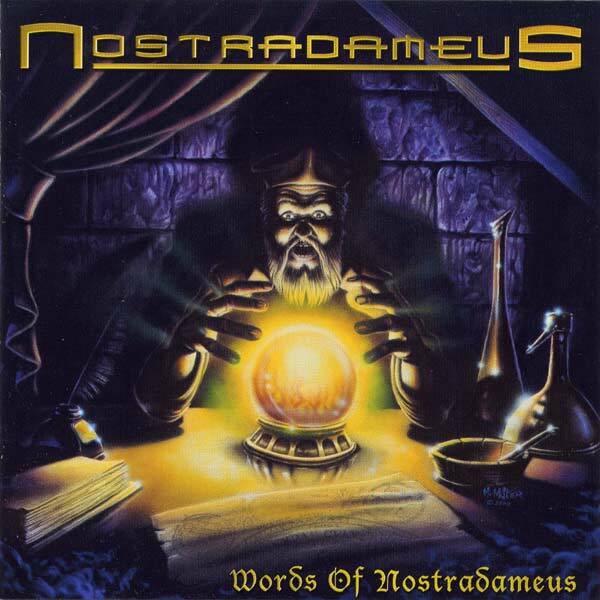 During the spring and summer -99, the band was buisy with writing and preparing new songs for the forthcoming album and in November -99, Nostradameus entered the studio again to record what was going to be the "Words of Nostradameus" album. The result of this recording turned out to be so good that the label decided to use the Finnvox studio in Helsinki to do the final mix of the album. This was, once again, a dream coming true to the band and even though they had to wait for about five months for a time in Finnvox ( it´s very hard to get a time with Mikko Karmila in this studio ) they decided that it was absolutely worth it. And it really was! The final product became so much better than the guys ever would have dreamed of. Unfortunately, at this point of time, another problem had come up. Both Gustav and Erik had deciced to leave the band. They felt that it took too much time. Well, there was not so much to say about it. After all the band was just supposed to be "a fun thing" from the beginning and was now on its way to become something much bigger than that. So, without any hard feelings, Freddy and Jake started to search for some new members during the summer 2000. The first one they got in contact with was Michael Åberg. A very talented guitarist who played together with Magnus Rosén (Hammerfall) and Michael von Knorring (ex. 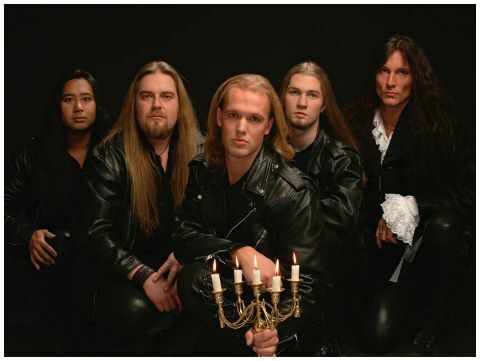 Yngwie Malmsteen) in a cover band called M.M.M. Freddy just happened to be to be at the pub where they were playing one night and asked Michael if he´d like to try as the guitarist of Nostradameus once they had a new drummer. He said yes an the guys decided to stay in touch. Shortly after, Jake saw a note on the wall in a musicstore in Gothenburg about a hardrock/metal drummer who was looking for a band. So he wrote down the number and later on that evening, after having shared a couple of beers with Freddy, they decided to call this guy, Jesse. He seemed very enthusiastic and a few weeks later, the four guys started to reherse on the materiel. It turned out quite OK and since they both fitted so good as persons in the band, Jake and Freddy decided to take them in as permanent members in the autumn 2000. At this point of time it was decided that they had to get a basist into the band also. It was no problem for Freddy to make both the bass and the vocals in the studio but it never became such a good show as they wanted since he was locked up by the michrophone while singing live. Jesse then came with the idea to contact an old friend of his, Thomas, who had a lot of experience from other bands where he´d played the bass. So they tried him and after the first gig with the new line-up, on the 15:th of November, Thomas was also a permanent member of the band. But despite this fact, the guys finally got the opportunity to hit the roads for the first time for a major european tour as an opener for their labelmates Edguy. The only problem was that Jesse at this point of time, due to personal reasons, decided to leave the band. So a new drummer once again had to be recruited. Thomas came up with an idea of a friend of his that might be worth testing. This guy was Esko Salow and he, already from the start, made a tremendously stong impression on the rest of the band, so after the gig in Wacken, he was also a permanent member of the band. The tour lasted from the 2:nd of November to the 8:th of December and was a huge succes for all the parties involved. The ticketsales and the reactions of the audience was way much better than anyone dared to hope for before it started. Since things, to this point, had gone quite fast (2 albums released in just 12 months) the guys felt a bit worried when the tour started since they almost didn´t have any new ideas for the future. But propably because of the very inspiring atmosphere, with the reactions of the fans during the gigs, the creativity was on top when they returned back home so in less than 2 months, enough material for a 3:rd album was written. So in February -02, the guys once again hit the rehersementroom to prepare and arrange the new material. 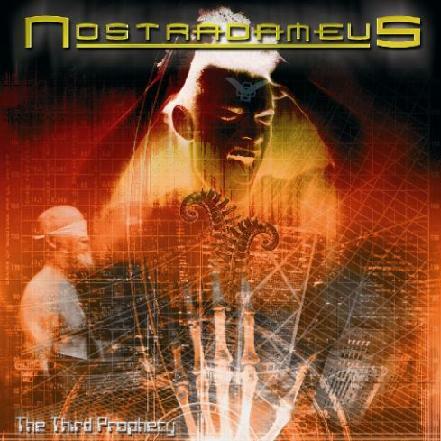 The recording of what was going to be "The third prophecy"-album started in the summertime -02. This time, the guys decided to use a different studio than on the previous albums. First of all to get some new impressions, but also since the new materiel was a bit different, quite much more raw and heavy, than the previous ones. The recording was made in the KEG-house studio, situated on one of the islands outside Gothenburg, almost "at home" for Freddy and Jake. It was done in a very harmonic atmosphere and most of the time was used finding the right feeling in the recordings, something the guys didn´t put that much attention to on the previous albums when the main goal was to make tecnically perfect performances on each instrument. The result, however, was something quite extra. In September, the album was mixed, not in Finnvox this time, but in Studio Fredman in Gothenburg by Fredrik Nordström. The main reason was to acheive a little bit "rawer" sound, more a la "Heavy-metal" compared to the ordinary "perfect, but a bit soft"-sound that´s quite common in the Power-metal scene today. Of course, Fredrik sure didn´t make anybody disappointed.